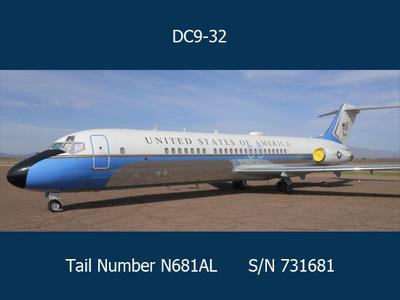 Aviation buffs looking for something besides an old warbird or the latest Gulfstream to add to their collections might want to consider this: a former U.S. government DC-9. Why? Well, this McDonnell Douglas bird, known as a VC-9C, once served as Air Force Two. That’s right, in it’s heyday, N681AL hauled vice presidents around for a living and, according to the General Services Administration listing, may have even served as Air Force One. Starting bid? Only $50,00o. The auction begins May 15. For the complete listing, click here and type DC-9 in the search box. No, the “Starting Bid is NOT $50K! That’s just the fee to get in the door. A huge difference. Please try again. What would be helpful is basic stats on the airframe and engines- you know – basic stuff like hours and cycles! Despite this airplane’s age, I’d guess that the hours/cycles are quite low for the type. If one can afford to buy it, one can probably also afford the hefty operating costs. Other notes: The USAF/GSA will probably require that i t be repainted and NO, it does not come with an ‘extension’ of the President’s Red Phone. Just assume that all military/presidential gear was removed in 2005. Get a grip. First, the starting bid. Well, according to the site, the current bid is $50,000; granted the bidding has yet to start, but I’m going by what I see on the page. The bid deposit also happens to be $50,000. I’m sure anyone seriously considering a bid would discover that fact and more by visiting the GSA site. Second, yep, it’d be nice to have some details such as airframe and engine hours, but I couldn’t find it at the time of posting. Maybe the GSA will provide it to serious bidders. Third, nobody said anything about a phone, red or otherwise; if you’d like to see a list of items to be recovered and removed from the plane, feel free to check out the supporting documents on the GSA site. You’ll also find an exhaustive list of spares. Fourth and finally, we at Flight Journal pride ourselves on being fully gripped and we stand by the post.